Spring is an amazing time of year all over the world! On the Central Coast, spring brings gorgeous, lush wildflower fields, sunny, warm days, and delicious fruits and vegetables featured at our many farmer’s markets! We are lucky to host tons of different farmer’s markets, from the famous Downtown San Luis Obispo market on Thursday evenings to the beachfront Pismo Beach market. This is the perfect season to head to these beautiful, outdoor markets and support local businesses all over the county! Make the most of your next farmer’s market run by focusing on the season’s ripest crops, and then use these fun, easy recipes to use all your delicious produce! Artichokes seem to many like a daunting task for preparing, cooking, and serving, but they can be very simple with a few tips! Fresh artichokes are an amazing way to spice up your next meal and add tons of nutritional value. 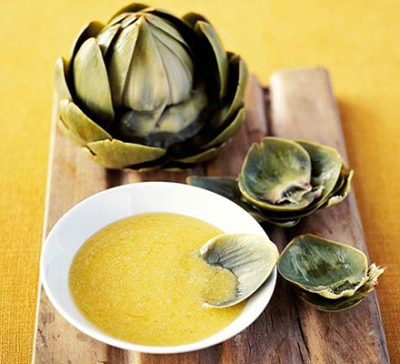 They are easier to cook than you think, so use this delicious recipe for simple steamed artichokes with a rich garlic butter sauce to add to your next dinner. • Instructions: Snap off outer leaves and with a serrated knife, cut off 1/3 top of artichoke. Snip remaining spiky tips and trip stem so artichoke can stand upright. Rub all cut surfaces with 1/2 lemon to prevent discoloration. Set steamer bag in large pot and add enough water so it reaches just below the basket, then squeeze remaining lemon juice into water with 1 tablespoon salt. Bring water to a boil and place artichokes in steamer basked with the stem side up. Cove pot and steam until the heart (inside middle) is tender when pierced with a knife. Separately melt butter and garlic together, serve on side for dipping. When apricots begin to ripen, nature is telling us the first signs of summer are on their way. These small, orange fruits are full of essential nutrients like beta-carotene and fiber, known to help with indigestion, and skin care. There are tons of ways to prepare apricots, from adding a sweet element to a savory dish or creating a yummy, summer dessert. Use this dessert recipe for brown butter apricots with brioche to wow any dinner guest! • Instructions: Toss apricots with 3 tablespoons of sugar and place remaining 5 tablespoon of sugar on a rimmed plate. Dip both sides of each brioche slice in sugar on plate. Melt 2 tablespoons butter in large pan until foaming, then add brioche slices and cook until golden brown on bottoms. Add 1 tablespoon butter and flip slices, then cook until other sides are golden brown. Set brioche aside and wipe out pan, then increase to medium-high heat. Add 4 tablespoons butter and cook, swirling occasionally, until butter is golden brown. Add apricots and salt and cook, swirling to coat apricots in butter until heated through (about 1 minute). Remove pan from head and add water, swirl to create smooth sauce. 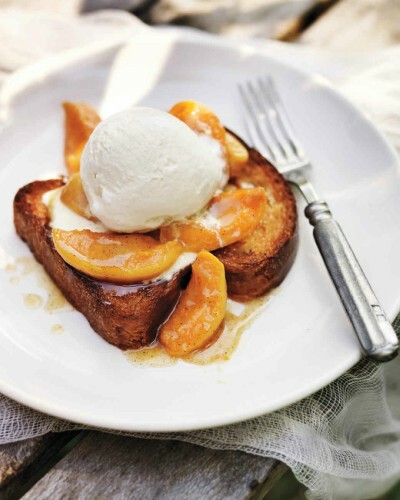 Top each brioche slice with apricots and a scoop of ice cream, serve immediately. The crisp, sweet texture and taste of asparagus make this vegetable the perfect pairing with tons of different spring recipes. Whether you want to grill, steam, simmer, roast, or saute them, asparagus can be prepared in tons of different ways to compliment your meal. 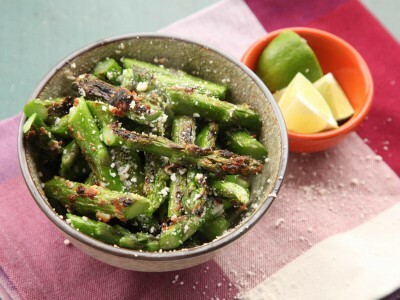 Try these super easy, fast asparagus to add some spice and flavor to your next meal! • Instructions: Preheat broiler to high. Toss asparagus in oil and 2/3rds of cheese in large bowl, then season with salt and pepper. Transfer to foil-lined baking sheet and broil to 2 inches from element until tender and well-charred (about 4-8 minutes). Transfer to bowl and toss with remaining cheese, then serve with lime wedges.